Pete Hanshaw: New Photoshop Exporter- ExportThis! The end result is a cleaner, smaller and all round better Photoshop tool that does a number of kinda cool things. Because its written to take advantage of the native API there is a significant difference in app size- Texture Monkey being almost 40mb when including all the additional GUI and Python library files it required, vs a 29kb .ZXP installer for ExportThis. The ZXP is easily distributed, and uses Adobe Extension Manager CC to install/update/remove itself. Within the tool, the document template system was added to allow artists to easily make documents that would be compatible with the exporter (as a lot of it is group name/hierachy based) but I expanded on it to allow artists to make and save their own particular document setups too. The tool uses the Adobe extension framework, which is made up of several components, each of which operate on different levels and have their own little quirks. The GUI is created in a very similar way to a web page, using HTML and CSS to define it's layout, content and internal behaviors. I was able to embed things like interactive help drop-downs using JQuery, as well as easily modifiable selection lists and other standard web-fare. All calls to the actual Photoshop extension are passed as strings to evaluate (including arguments) meaning passing data back and forth between the extension and the GUI can be pretty cumbersome. As I decided pretty early on that I wanted to use JSON files to store both user settings (such as the last project used, and their local project root) I had to figure out a way to be able to both read and write data from the tool, which I ended up doing on the Photoshop JSX side, which is the third component! The JSX also contains a component that can interact with the local system through the command line in order to check out elements from Perforce, using .bat files. (the hidden) GUIRilla, or a sprite exporter. 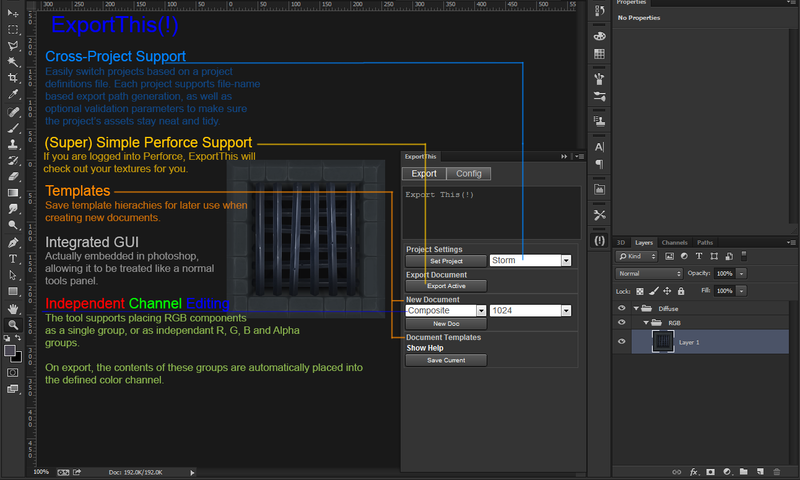 Although the main focus of the exporter is Texture exporting for 3d models, an additional feature is the ability to author and export multiple 2D sprites from a single document. The exporter allows a "UI_SPRITE" flag document name prefix to be defined in the Project Settings, which will change the exporter to treat the document as a sprite atlas and export each group as a individual trimmed element, with transparency. It's pretty cool, but I'll go into this in a little more depth in another post, as its a whole other workflow. Overall, it was a fun exercise and the Artists using it have responded very well to it as a replacement for TextureMonkey.